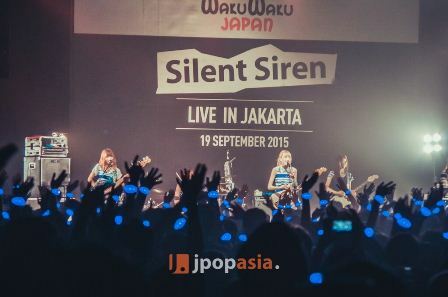 Last September 19th, one of Japan's rising girl bands Silent Siren thrilled their Indonesian fans during their first ever solo live in the country. 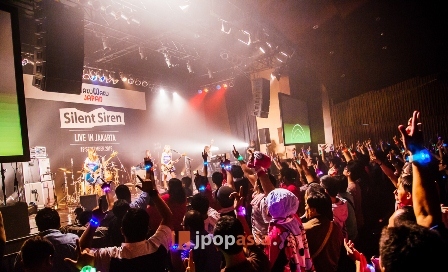 Presented by WAKU WAKU JAPAN, Silent Siren Live in Jakarta was held at the Upper Room, Annex Building in the Indonesian capital. Interestingly, the Indonesian anthem "Indonesia Raya" was played before the event started. All fans stood up and participated in the singing as if in a flag ceremony. Then the lights turned off and the concert began with the upbeat song, "Muon no Kouhaku". After finishing two songs in a row, the group also known as SaiSai took a break to introduce themselves and asked fans how they felt about the concert. Needless to say, everyone responded with an excited scream. SaiSai then performed six more songs. After which, the group shared their plans after the concert. They also asked which songs the fans are hyper the most for. "Kakumei" which SaiSai sang at BUDOKAN was the answer. After three more songs, the host asked the band members about their thoughts on Indonesia and its language. Sumire Yoshida noted that Indonesian weather is hot while Yukako Kurosuka said she liked everything about Indonesia, especially the dish soto ayam. Aina Yamaguchi, on the other hand, took the chance to talk about the group's merchandise. Halfway through the concert, the mood turned mellow as the group played "Kimi ga Kureta Mono", the OST from the live action TV drama "anohana". All fans sang along while remembering their favorite scenes from said drama. The following moments were really engaged the fans as SaiSai performed one special song after another. Excitement also doubled when the group revealed that 4 lucky fans get to bring home each an autographed shirt. As a closing song, SaiSai did "Guruguru Wonderland". The members immediately went backstage afterwards. However, the fans stayed put and shouted for an encore. SaiSai did not disappoint and went out again. This time, they were wearing a different costume and launched into "What show is it?". All fans stood up and the noise level escalated as SaiSai injected more fun and heat into their performance until the very end. Their song "Pi-san" closed the evening. As the event wound down to a stop, Sumire Yoshida took a photo of everyone as a special memento of their time with Indonesian fans. And it's a wrap! 18. (enc) What show is it? 1) Is there any difference between tonight's concert and your performance at last month's Gelar Jepang Universitas Indonesia? - We will sing more songs including the theme to anohana. 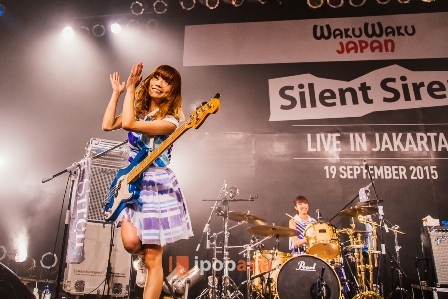 2) How is Silent Siren different from other girl bands like Scandal for example? - We have a good relationship with them and our ages are actually close. If Scandal can be described a 'cool' then we can be described as 'pop'. Our band and our songs are more like pop. 3) What does being an idol mean to you? - A person who sing and dance while giving smile to others. Because we are a band and not an idol, we can't really describe ourselves as an idol. 4) Do you feel nervous when you have to do a solo live in another country? 5) Can all of you cook? What are your specialties? Aina Yamauchi / Ainyan : If there's time I will cook. My specialty is tofu hamburger because I like tofu. While here in Indonesia, I tried tahu goreng and it's very delicious. Hinako Umemura / Hinanchu : I cannot cook. But when I go travelling in a different country like Indonesia, my friends like kerupuk or something like that. Sumire Yoshida / Suu : Yes, I can cook. My specialty is fried egg. It seems simple but there's a lot of meaning into it. Yukako Kurosaka / Yukarun : Yes. My favorite is nikujaga. But while here, I tried eating soto ayam. It's very delicious and I want to eat more.